Closely monitor refrigerator and freezer temperature with the RCP Stainless Steel Refrigerator/Freezer Thermometer. 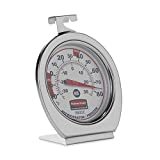 Made of durable stainless steel, this thermometer is designed to withstand the rigors of the toughest professional and home kitchens. The scale reads in both Fahrenheit and Celsius, and it features clearly marked increments to facilitate easy readings. Easy to install, the thermometer can be hung from a rack or stood up on a baking tray.